with the head safely held above the water in order to breathe. head under the surface for several seconds. The guide ensures that the receivers’ head returns above the surface to take a new breath. Over the next several minutes the two partners find a natural rhythm of movement and breath, so that there is a energetic flow. The session can then proceed as long as the partners are comfortable. 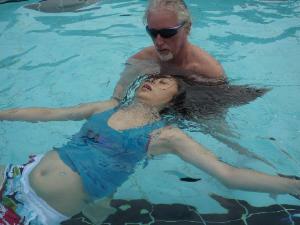 Both the roles of being an Aquafloating Guide and Receiver support deep relaxation in both body and mind. Stress and tension can be released from the muscles of the body as well as the deeper subconscious of the mind. Trust can replace fear, letting go or ‘going with the flow of life’ can appear instead of fighting the current of difficult life circumstances. becoming one with the Existence - thus it has quite a Tantric quality. As the goal of tantra is also to aim towards the ultimate oneness with the support of a partner. and the guide might experience the receiver is actually guiding them in a non-verbal communication. Being in water is natural for us all. 70% of our planet is covered by water and 70% of our body also consists of water. Our life begins in the waters of our mother’s womb. Water easily contains energies. thus Aquafloating can be an ideal method for those wishing to become more friendly with water. we will spend in the group hall for therapy and meditations. * Breath Therapy sessions will aid release of emotional tensions and fears. originate in early life conditioning. * Tantra meditations will support the quality of connection between partners, friends and lovers. and body oriented therapies. Samudro assisted them in their first Aquafloating Course. 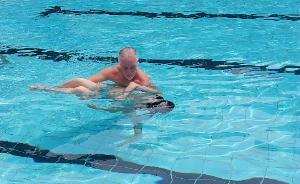 hence it has a greater holistic approach than only body or health oriented aquatic therapies. Primal), Reliving Past Lives, Bodytypes Character Analysis, Family Constellations, Aura-Soma Colour System and Osho Meditations. Please bring to the course: bathing suits, a nose clip, swimming goggles, sunscreen protection cream, extra t-shirts, and a sun hat.